We’d love your help. 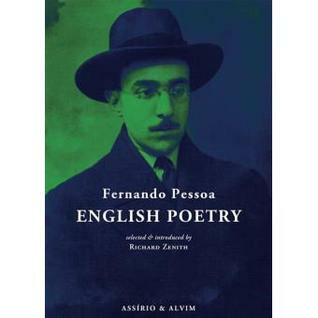 Let us know what’s wrong with this preview of English Poetry by Fernando Pessoa. To ask other readers questions about English Poetry, please sign up. They were found in winter weather"
Tenho de admitir que gostei mais ler Pessoa em inglês do que em Português (afinal talvez faça sentido - Fernando Pessoa desejava ser um "poeta inglês"). Este livro despertou o meu interesse pela poesia do autor, algo que no meu secundário não aconteceu, de todo. Os poemas são extremamente variados em tamanho, métrica e formato. Alguns são cómicos, outros profundamente intrspoetivos e outros um pouco de ambos. Um dos conjuntos "Documents Of Mental Decadence" é particularmente interessante. We pass and dream. Earth smiles. Virtue is rare. Age, duty, gods weigh on our conscious bliss. Hope for the best and for the worst prepare. Ich mag die Lyrik von Pessoa sehr. Sie ist so düster und romantisch. Dieses Buch wird definitiv nicht weit weg gelegt. Ein echter Gewinn für meine Lyriksammlung. Er staan mooie gedichten in, maar veel is naar mijn gevoel wat gekunsteld. Af en toe ook wat te romantisch. Fernando António Nogueira Pessoa was a poet and writer. It is sometimes said that the four greatest Portuguese poets of modern times are Fernando Pessoa. The statement is possible since Pessoa, whose name means ‘person’ in Portuguese, had three alter egos who wrote in styles completely different from his own. In fact Pessoa wrote under dozens of names, but Alberto Caeiro, Ricardo Reis and Álvaro de Fernando António Nogueira Pessoa was a poet and writer. It is sometimes said that the four greatest Portuguese poets of modern times are Fernando Pessoa. The statement is possible since Pessoa, whose name means ‘person’ in Portuguese, had three alter egos who wrote in styles completely different from his own. In fact Pessoa wrote under dozens of names, but Alberto Caeiro, Ricardo Reis and Álvaro de Campos were – their creator claimed – full-fledged individuals who wrote things that he himself would never or could never write. He dubbed them ‘heteronyms’ rather than pseudonyms, since they were not false names but “other names”, belonging to distinct literary personalities. Not only were their styles different; they thought differently, they had different religious and political views, different aesthetic sensibilities, different social temperaments. And each produced a large body of poetry. Álvaro de Campos and Ricardo Reis also signed dozens of pages of prose.